Smart, bookish Belle, a captive in the Beast's castle, has become accustomed to her new home and has befriended its inhabitants. When she comes upon Nevermore, an enchanted book unlike anything else she has seen in the castle, Belle finds herself pulled into its pages and transported to a world of glamour and intrigue. The adventures Belle has always imagined, the dreams she was forced to give up when she became a prisoner, seem within reach again. The charming and mysterious characters Belle meets within the pages of Nevermore offer her glamorous conversation, a life of dazzling Parisian luxury, and even a reunion she never thought possible. Here Belle can have everything she ever wished for. But what about her friends in the Beast's castle? Can Belle trust her new companions inside the pages of Nevermore? Is Nevermore's world even real? 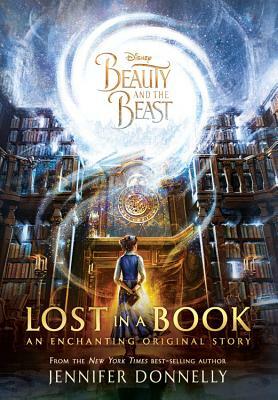 Belle must uncover the truth about the book, before she loses herself in it forever. Jennifer Donnelly is an award-winning, best-selling author of books for young adults and adults, including the Waterfire Saga: Deep Blue, Rogue Wave, Dark Tide, and Sea Spell. Her other young adult novels include These Shallow Graves, Revolution, and A Northern Light, winner of Britain's prestigious Carnegie Medal, the Los Angeles Times Book Prize for Young Adult Literature, and a Michael L. Printz Honor. She has also written Humble Pie, a picture book, and the adult novels The Tea Rose, The Winter Rose, and The Wild Rose. She lives in New York's Hudson Valley. You can visit her at www.jenniferdonnelly.com, or on Facebook, Twitter, and Instagram @jenwritesbooks.